Downloaded the British Isles Map but although the map detail is excellent the roads are not labelled, e.g. M1, A23, B4456 etc. No, that's not normal, they should be labeled. In my computer (MpsSource) I can see motorways and trunk roads labeled, but not other minor roads. Don't you see any road labeled? I am happily using many of your maps for my Caminos. I would like know if you can produce a TOPO map of Japan (for the Kumano Kodo pilgrimage). Happy to make a donation - how much more is needed? As you can see at +Maps section, nobody has contributed for this map till now, so you'll have to contribute 35 € for Japan map. how does one use the errors to correct a map download? thanks so much for all your work. ill be a member for life! Each file in the errors.zip file contains a list of different kind of errors found in the map. You have also a README which gives details about what kind of error each file contains. You can use these lists to edit OpenStreetMap data and correct the errors. 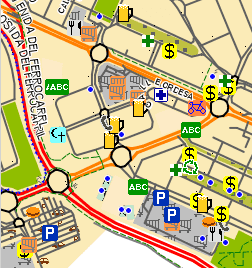 You can edit OSM data online, at www.openstreetmap.org or using a dedicated software as JOSM. Is there a way to download your map of Colombia into this device? I'm sorry, these maps work only on Garmin devices. See the FAQ for more info.